April 06, 2016 09:00 ET | Source: GreatCall Inc.
SAN DIEGO, CA--(Marketwired - Apr 6, 2016) - GreatCall Inc., the leader in connected health for active aging, is redefining independence with the introduction of its expanded connected health lineup. 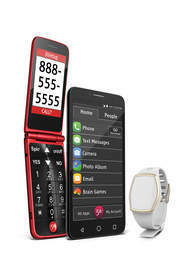 The all new Jitterbug Smart and Flip phones and the Lively Wearable enable older adults and family caregivers to choose health and safety solutions that fit their individual needs, allowing for easier integration into their lives. "The needs of older adults aren't one size fits all," says David Inns, CEO of GreatCall. "Our commitment to active aging is founded in deep customer knowledge -- and using that understanding to provide solutions that meet the needs of a wide range of older consumers and their family caregivers. With the new Jitterbug devices and Lively Wearable, we continue to expand our connected health platform and enable more people to stay independent longer." The Jitterbug Flip brings a sleek look to a consumer favorite. The larger handset features a bright 3.2-inch screen and bigger buttons for easy dialing, a camera with auto focus and flash, a magnifying feature and a flashlight. "The Jitterbug Flip's powerful new platform sets the stage for the future, enabling GreatCall to add functionality and features as customer needs evolve," adds Inns. Combined with Jitterbug's health and safety features -- its dedicated 5Star button, providing instant access to 5Star service and its team of highly-trained urgent response agents, easy yes/no navigation, access to GreatCall apps and a charging dock -- the new Flip answers the full range of customer needs. 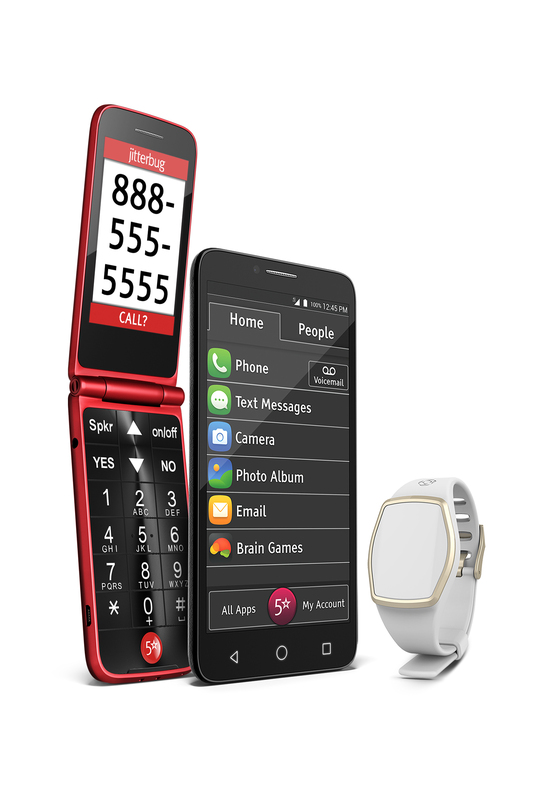 "Consumers who still want to use their mobile phone as a phone have been asking for a reliable flip phone design, that at the same time provides the benefits of smartphone features as well as high speed LTE connectivity," said Steve Cistulli, President and General Manager for ALCATEL North America. "We're proud to be the first handset manufacturer in North America to offer just that with the Jitterbug Flip." The Jitterbug Smart integrates GreatCall's health and safety services into the latest smartphone technology. Demonstrating simplicity and ease-of-use in a big way, Jitterbug Smart has one of the largest, brightest screens at 5.5 inches (38 percent larger than the previous version), higher resolution display, faster data speeds and a higher resolution camera with flash. With easy access to the Internet, text, and email, the Jitterbug Smart takes connectivity to a new level. Designed specifically for active aging, the Lively Wearable offers activity tracking and features a one-touch button that connects to the 5Star service and its team of highly trained agents in emergency situations. The wearable must be linked to the user's smartphone, and connects via Bluetooth to transmit activity tracking information. Family caregivers stay connected through the Link app, which allows them to follow the user's activity and send messages of encouragement. The Link app also alerts family members if the emergency response button is activated -- on the Lively Wearable as well as the Jitterbug Smart and Flip. GreatCall is the leader in connected health for active aging. With health and safety solutions for older adults and their family caregivers, GreatCall's innovative suite of easy-to-use mobile products and award-winning approach to customer care helps aging consumers live more independent lives. Products and services include: Lively Wearable, GreatCall Splash, Jitterbug Flip, Jitterbug Smart and health, safety and medical apps Urgent Care, GreatCall Link, MedCoach and 5Star.